According to the WA Waste Strategy, West Australians not only produces more waste per capita than any one else (over 2500 kg per person each year!) we also have the lowest rate for recovery and diversion from landfill of any mainland State, with only 32% of material being recovered, and the remaining 68% buried in landfill. Clearly this has to change but the real debate is: what is the best way forward? With Waste to Energy (waste incinerators that produce electricity) providers actively seeking environmental approvals and the SMRC’s composting system reaching the end of its life there is inevitably going to be some major changes in how Fremantle deals with its waste in the years ahead. How do we ensure we use less, recycle and compost more, and ultimatley send less waste to landfill? It was a big week for new initiatives at Fremantle Council this last week and the new draft of the plastic bag local law and the new car sharing policy were top of the list. While it might seem that these issues arise suddenly in the public realm, the reality is City of Fremantle staff put a lot of hard work researching and pulling these laws and policies together before they come to Fremantle Council. So a big thanks to them. First is an early morning Nine interview I did and below that is a summary of the two issues that our staff also pulled together. Council has endorsed the Plastic Bag Reduction Local Law 2014, which will now be submitted to State Parliament for final approval. The law is designed to reduce the use of plastic shopping bags within the City of Fremantle by prohibiting retailers from providing single-use, non-biodegradable plastic shopping bags to customers. The legal advice found that the local law itself, with the exception of the mandatory fee for alternative plastic bags, was within the power of the City of Fremantle to implement as per the Local Government Act 1995. The local law was accordingly redrafted, removing the mandatory 10 cent fee, publicly advertised and resubmitted to council. A phasing in of the new law will occur and will include an assistance program for local businesses and a public education program. Council has approved an initial two year car share trial to promote an increase in the uptake of car sharing options and facilitation of car share operators across the City. The City will now undertake work to facilitate a fleet of at least 50 viable car share vehicles in the municipality by 2020. This network of vehicles will enable a significant number of households and businesses in Fremantle to have access to a car without having to commit to the purchase of one. To achieve this target the City will support on-street car sharing and the placement of shared cars in city car parks; new planning controls to integrate opportunities for car sharing into urban renewal areas; marketing and education, and facilitation and enforcement of dedicated car share spaces. On consulting with local governments supporting car share schemes on the east coast of Australia, a decision was made to develop a new policy to encourage a similar scheme in Fremantle. The City has also recently been approached by a number of car share operators enquiring about the possibility of supporting car share schemes within Fremantle. Car share programs allow members to book a nearby vehicle for a short time, unlock it with a membership card, and later return the vehicle at the end of the booking. Cost is calculated on time and trip distance. Many cities have recognised the opportunity to integrate car sharing with public transport, public bicycle schemes, publicly owned vehicle fleets, and other transport sustainability programs. Sydney and Melbourne support several successful car share systems, and Adelaide and Canberra will soon establish new systems also. The successful Sydney policy is the model on which Fremantle’s new policy has been developed. 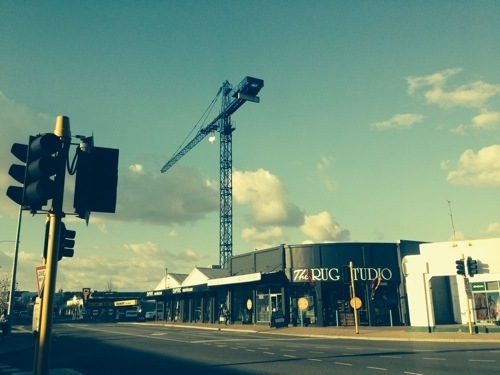 Is it bad that I’m so excited by this new blue crane in this tired part of Freo? Hear from experts leading change in the waste and recycling landscape in WA away from our state’s long held reliance on dumping in landfill. From zero waste to recycling, composting, and energy from waste incineration – the panel will present views on the future of waste and answer questions. It was a huge day for Freo and Fremantle firm CODA at last night’s 2014 Australia Award for Urban Design, hosted by the Planning Institute of Australia. Fremantle received a second acknowledgment with a commendation give to the King’s Square Urban Design Strategy by CODA Studio, the City of Fremantle and Creating Communities Australia. Finally, CODA appeared again in WA’s second commendation, this time a regional project, the Pilbara Vernacular Handbook, developed in collaboration with Landcorp. Well done to all involved. Very well deserved. The following article is a worthwhile reflection on the Tassie’s recent plastic bag ban. It interestingly talks about the merits of Freo’s stricter approach of banning bags below 60micron rather than the just the 35 micron used in Tassie and other places around Australia. It confirms that if passed this month at Fremantle Council (and then if not rejected by the State Government!) then Freo is likely to have the best law in this area in the country. Six months after the ‘plastic bag ban’ in Tasmania we are still buying them and using them, albeit not the disposable lightweight versions. Does the ban go far enough, or have we created a new ‘normal’ with heavier versions in the market? Tasmanian director of Do Something Ben Kearney says it will take time for people to adapt to the plastic bag ban that was implemented in November 2013. He is concerned, however, that six months after its introduction there are many small businesses that continue to give away the slightly heavier ‘reusable’ bags, therefore side-stepping the dissuasive element the ban intended. “Overall, there is no doubt that the ban is having a positive effect on reducing the use of plastic shopping bags. Retailers are not required to charge for the new plastic bags. They can choose to incorporate that cost into their prices for goods. “When we pushed for the ban originally, all three political parties agreed to a ban of both the lightweight and thicker plastic bags, and then just shift to biodegradable bags. “Ultimately when the Labor Party legislation came out it didn’t include a ban on the thicker, what you would call department store type bags. In 2003 Coles Bay became the first town in Australia to ban the plastic bag to address the problem of litter in the area. Mr Kearney, then a bakery owner and president of the local tourism association, led the campaign, with retailers in the area adopting reusable paper bags and calico bags as alternatives. In the intervening years he has continued to be involved in pushing for changes in state and federal legislation to limit the usage of plastic bags. One of the alternatives envisaged when getting the plastic bags banned was that biodegradable bags could replace those that persist in the environment for a long period of time. Few retailers in Tasmania are supplying compostable biodegradable plastic shopping bags because they are more expensive for the equivalent durability. Retailers can also find information on the thickness of plastic required for the bag to be considered ‘reusable’. No part of a reusable plastic shopping bag they provide can be less than 35 microns in thickness, or fines may apply. While the thicker plastic bags are still cheaper than the biodegradable ones and the brown paper bag type, Mr Kearney acknowledges retailers will likely continue to use them. The City of Fremantle has recently proposed a plastic bag ban that would set the thickness of plastic bags at 60 microns, which would make the biodegradable and paper ones cost competitive. Ben Kearney is upbeat about what has been achieved, especially in terms of environmental outcomes. “I’m still positive about it. “There are some areas that are working perfectly well, and some areas that are less so. “I think that you will find that the number of bags that are being used would have dropped considerably and from the point of view of the types of bags, the light weight bags particularly were harmful. “I think there is certainly a case to question whether we shouldn’t go a bit further at some point. This week was one of those weeks that felt big or at least stimulating and interesting. Also this week the acting CEO Glen Dougall, Tim Milson from the Fremantle Chamber of Commerce and the Matt McNeilly from Sirona and I met with Dean Nalder the reasonably new Minister for Finance and Transport and I am pleased to report that he recommitted the State Government to moving a government department to Fremantle. The Fremantle Council had been concerned this process was losing momentum pace so we were pleased to hear it was back as a high priority once again although the timeline in likely to be about 6 months longer than previously anticipated. I also got the meet the new Director General of the Department of Planning Gail McGowan with SW Group CEO Mick McCarthy and discuss the importance of integrated land-use and transport planning for our region. I finished the week with a meeting with the Premier Colin Barnett (wonderfully assisted by acting CEO Glen Dougall and Cr Doug Thompson) . This was also a positive meeting. Sometimes in Fremantle you can’t help but feel we are not getting enough love from the State Government to realise our potential as Perth’s second city, but if we can make good on the commitments made this week then I think there are some very positive signs for partnership and progress on key issues. It felt like a good week for Fremantle.